This follow-up to Heads Up! differs little from its predecessor. There are some trademark arrangements in "Summer Samba" with its Brazilian influence, "Windy" and "Along Comes Mary". One standout is the arrangement for "She's Leaving Home", and an almost obligatory cover of "The Look Of Love" that many of the A&M artists covered on their own albums. Baja Marimba Band: Do You Know The Way To San Jose? The old-time feel of "The Ballad of Bonnie and Clyde" and the swiftly moving current of "I Say A Little Prayer For You" are highlights of another solid Baja album. "Sunrise, Sunset" is a workout for Julius Wechter on marimba, playing solo throughout part of the song, and given sparse accompaniment of guitar, bass and drums during the rest. (Recorded close-up, the marimba spans the entire soundstage between the speakers, volleying back and forth as Julius runs his way up and down the scale.) Again, more fine originals are presented here--"San Fernando, "For Bud" and "In A Vera Cruz Vein". "Flyin' High" and "(There's) Always Something There To Remind Me" anchor this Baja Marimba project, with the excellent originals "Big Red" and "Peru '68" among the highlights of the set. The sound of this set recalls the previous album in many ways. Another classic album cover, with Julius and crew depicting the crossing of the Delaware (could it be the Rio Grande?). This is a more relaxed offering than we're used to from the Baja Marimba Band. 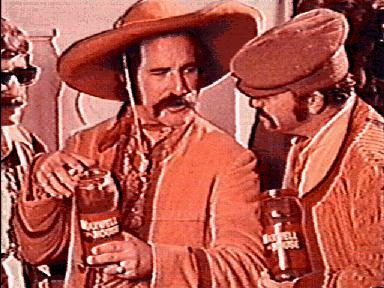 Rather than opening with both six guns firing, a relaxed "Cielito Lindo" opens the can, followed by an even more relaxed "Wave". What the upbeat tunes like "I'll Marimba You" and Eleanor Rigby" lack in firepower, they make up for in restraint. "Samba Nuevo" has some neat twists to it, including a Turkish 2-2-2-3 beat reminiscent of Brubeck's "Blue Rondo A-La Turk". 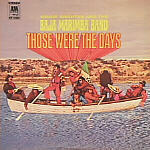 This hits collection spans only the first six Baja Marimba albums (up through Fowl Play). It sticks mainly to their cover versions of popular songs and only includes a couple of originals. But these are probably the most recognizable of their repertoire nonetheless, and capture the essense of the group at their best. Refer to the original album listings for details.